fixed an error in cdrom loader for non-eltorito drives : "_devld not found"
** duplicate/incorrect entries are being addressed by Victor. Typing "bcd" or "ubcd" at the command prompt would loop back and execute any previously launched application if called from the root isolinux menu INSTEAD of launching the menu (put simply, I forgot to clear an environmental variable). 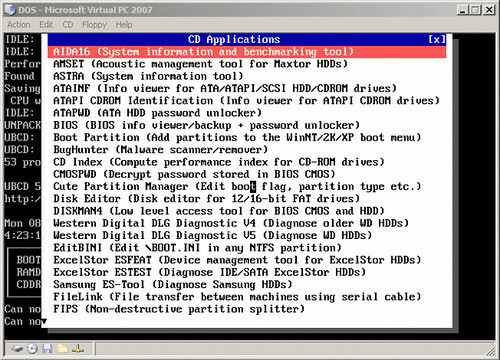 - moving of EBDA (Extended BIOS Data Area) is incompatible with some BIOSes. Now disabled. - usage: "devload [-l] %ramdrv%\lib\driver.sys /1 /2 /etc"
- any modboot varaible "*_NCFG" parameter is erased post-boot from "/etc/global.set"
removed split.exe, vmode.exe, batt.exe from "/bin/supp.cab"
removed share.exe, more.exe, undelete.com from "/level1/freedos.cab"
- drivers now stored in "/lib/udma/"
- type "udma" to launch or access via "menu"
- loads transparently as before - to prompt during boot, change MOUSE_NCFG to "0" in "\etc\global.set"
- to apply new config, type "mouse -u" to uninstall, then apply by typing "mouse"
Added UDMA modboot (version 1.3) "/level1/UIDE.CAB"
LFN Modboot (Revision 1.2), moved "/level1/lfn.cab" to "/level2/lfn.cab"
- Previously, if you typed "lfn -c" to access config, you couldn't exit! - IdelDPMS addded to "bin/utilz.cab"
- gcdom.sys/qcdrom.sys can be now accessed via "lib\qcdrom.cab" and "lib\gcdrom.cab"
Replaced edit.com with FreeDos Edit 0.7d in "bin/utils.cab"
Updated HX-DOS extender runtime in "/level0/win32.cab"
Addded DOS/32 Advanced DOS Extender (v9.1.2) in "/level0/dos32a.cab"
Added NTFSDOS back BUT in /level0 (won't pop-up during boot). 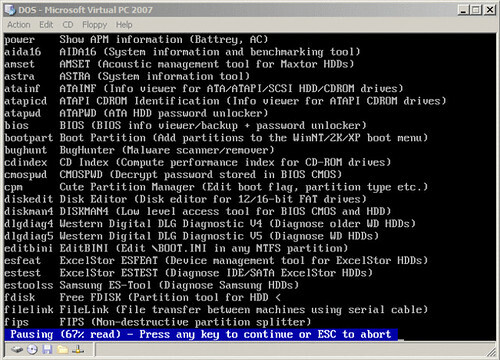 - If you wish to use it simply type "ntfs" at the command prompt ("ntfs -u" to uninstall). ubcd.bat, runapp.bat, ubcdos.bat move to "/bin/ubcd.cab"
Some others bits and bobs i'm sure i've forgotten. Last edited by as702 on Wed Aug 27, 2008 4:24 am, edited 23 times in total. Are you telling us to change the log ? If so, boy that a lot. no, son - it's a log of what changes have been made. I have found an unimportant "bug". The reboot command doesn't work in a virtual machine (virtualbox and qemu), but on a real machine it should work. When I try "fdapm COLDboot" it works, while "fdapm WARMboot" hangs. I didn't check how you did it exactly but probably just like I described some time ago at: viewtopic.php?t=1291&highlight=reboot+bat. Icecube wrote: I have found an unimportant "bug". I've tested both methods on VPC2007 and VMware - seem to work fine. I've since tried it on a couple of live machines - again, no issue. Tested using both types of memory managers (UMBPCI and EMM386). Also, both methods flush cache before triggering a reset (can't be a problem there). However, the warmboot method (calls shutDownHandler with AX=1) can crash if you're using incompatible protected mode software, since this method relies on calling the BIOS bootstrap code. Interestingly, the coldboot method (call shutDownHandler with AX=2) appears to involve polling hardware reset circuits via the keyboard controller (ctrl+alt+del). Upon examining the reboot.bat file, i've noticed the command calls warmboot by default. A likely fix would be to change this to coldboot (I may update the code to address this issue for revision 1.1). Can you tell me in which boot mode you experience this issue (i.e. UMBPCI, EMM386, no UMB). I get this in each boot mode (UMBPCI, EMM386, no UMB). I tested the dosubcd.igz for ubcd411. It is probably an issue of the virtual machine programs that I use. The authors should fix this. Choose whatever you think is appropriate. thanks for the suggestion, icecube. expect to see a fix included in revision 1.1 (in the works). I don't use the dosapps frequently, but maybe it would be nice if dosubcd.igz can handle extra command line parameters. (ntfs, kbrd=fr, ...) so they can be added to the config files so if someone makes a custom menu, he can add all the options that he wants to the append command without being prompted for those options in the freedos bootdisk. I don't know if other people like this or not. For me it isn't essential. It is just an idea. well, the ideal set-up would be similar to v4.11 whereby the FreeDOS environment could be easily used after quitting a program launched from BCDW. i have something similar set-up on my personal live cd whereby the freedos menu and help commands prompt users to access further programs without requiring a reboot. i'd need to speak to victor about it, but the way i manage it is by creating a set of batch files for each corresponding program in the fdubcd image or the cd. each batch file then calls an unpack routine to extract the necessary app to ramdrive before launching; if i want to launch an app all i have to do is type the app's name at the command prompt (or maybe access it from the menu). your suggested implementation would require something more elaborate (i'll look into it). there are some critical apps i'd like to see on UBCD since i'd rarely frequent FD otherwise. Maintenance tools like the MFT Defragmenter for NTFS drives (NTFS4DOS), HDD Regenerator (shareware), Spinrite (Demo), NTFS checkdisk, Gdisk, and so on. I need to raise these issues to Victor at some point. At the moment i'm concentrating on improving the core FreeDOS environment (stability/performance) before tackling the aforementioned issues (namely, improving accessibility and feature set). I was able to boot using the previous version (3.40). The machine is a HP ProLiant DL380, two Dual Core Xeon 3.33GHz procs, 4GB RAM. I get this error with all boot modes: UMBPCI, EMM386, and no UMB. The "no UMB (clean)" and "no UMB (ultra-defensive)" options are the only ones that boot. Any ideas? If more information is needed about my server, please let me know. i suspect it to be a problem with the a XMS memory manager (himemx). i've heard a similar report from another user. please upgrade to R1.2 if you can. this should hopefully remedy the problem. let me know if it doesn't. Thanks for the updated image. I can boot now! I am having another problem, but it doesn't belong in this thread. If you stumble across my new post and can help out, I would really appreciate it. No problem. Alternatively, send me a pm and i'll see what i can do. Is it possible _not_ to make the "bcd" menu pop up by default? In some apps (eg. BIOS), the default behaviour is to display the app's help page, and let the user launch the app again with the desired args. The "bcd" menu gets in the way of that. when the app finishes running will be sufficient IMHO. R1.27 is now available for download. "Runapp.bat" searches for this parameter. If found, it returns a variable that tells the menu generated by "ubcd.bat" to close and exit. I'll generate a list of programs which require this; out of the 53 programs included in 5.0b4, only a handful need have this applied (I'm still working on a fix for UBCD 4.1.1 without disabling the menu entirely). How was this made possible? The first two attempts involved recursive loop functions which proved rather slow. Finally "cheated" by concatenating the necessary files via "concat.exe"
There's plenty more to discuss but I'll leave it there for now. Enjoy. Can you zip the dosubcd.igz file the next time and name it dosubcd<version>.zip? I know that the size won't decrease, but it is easier for me to know where I have downloaded the last version of dosubcd so that I don't test an old version. reboot: will reboot (add parameter for COLDBOOT) your system. Change the move to a xcopy command. For the CD version this is not a problem, but I tested it on my usb thumb drive and all the startup.bat files disappeared . I think that is only the case with the ubcd5 version, not with the ubcd411 version. NagyD has passed the role of CuteMouse Maintainer to Eric, who has been busy working on a new release. Eric writes: "- less picky about PS/2 device detection, to support Dell Inspiron 1501 touchpad (as ctmouse 1.9 but not 2.0) which supports no int 15.c204. - new /O "enable wheel detection" and /M "enable old mousesystems mode" options (old /Y "disable old mousesystems mode" now silently ignored) - ported from TASM to JWASMD (various docs and diffs included) - versions with and without PS/2 debug messages included - docs should now be up to date, please check! - added notes about UART usage and DOS apps which support the wheel - updated more than half of the translations: Please help translating the /O and /M help text and EGA message to Spanish, Hungarian, Slovak and Latvian to complete the collection." http://www.coli.uni-saarland.de/~eric/stuff/soft/mixed/ cutemouse21b4-jwasm.zip ** Updated: Eric has released a new version of cutemouse21b4-jwasm.zip (same version label) so if you downloaded this release already, please get the new version. Also mirrored to ibiblio. It can be used by people who have edited, updated and remastered ubcd but first want to test if the iso works in real live without burning (if it can't be tested in a virtual machine). Can you zip the dosubcd.igz file the next time and name it dosubcd<version>.zip? Good idea. Consider it done for future releases. Thanks. I'll fix this immediately since I haven't been able to test the release using USB (and you're right, it should only affect UBCD 5). Interesting idea. I'll certainly look into it. @as702: Man, this is great! "power Show APM information (Battrey, AC)"
I'll generate a list of programs which require this. BTW, AIDA16 works properly now with LFN disabled.